1. Gelfand, D.; Innis, M.; Sninsky, J. PCR Applications: Protocols for Functional Genomics; Academic Press: New York, USA, 1999. 2. Mullis, K.; Faloona, F.; Scharf, S.; Saiki, R.; Horn, G.; Erlich, H. Specific enzymatic amplification of DNA in vitro: The polymerase chain reaction. Cold Spring Harbor Symp. Quant. Biol. 1986, 51 Pt 1, 263-273. Fig. 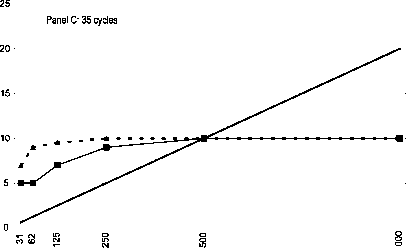 5 Quantitative PCR by comparing several results after the completion of different PCR cycle numbers. 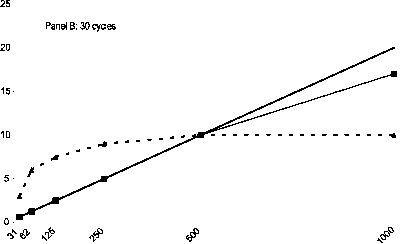 As an example, dilution curves for two different targets are compared. (From Ref. .) Panel A: Data after 25 cycles. For all amounts of target A, the observed amplicon amounts follow the theoretical prediction; with target B, the highest amount levels off. Panel B: Data after 30 cycles. 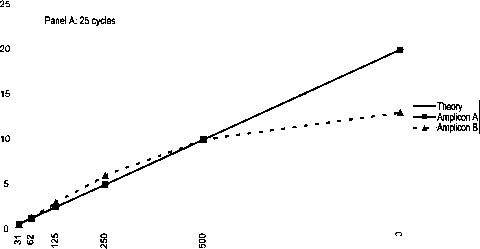 With target A, the highest amount is off, whereas essentially all values for target B are off from the theoretical prediction. Panel C: Data after 35 cycles. Plateau phase is reached for all amounts of targets A and B. Target copies reactions using energy-transfer-based fluorescent dye terminators. Mol. Biotechnol. 2001, 17, 135-142. 4. Corey, E.; Arfman, E.W. ; Liu, Y.; Vessella, R.L. Improved reverse transcriptase-polymerase chain reaction protocol with exogenous internal competitive control for prostate-specific antigen mRNA in blood and bone marrow. Clin. Chem. 1997, 43, 443-552. 5. Krupp, G.; Laue, T.; Söller, R.; Grewing, T.; Cramer, S.; Heß, M.; Spengler, U. Nucleic Acid Preparations of Pathogens from Biological Samples for Real-Time PCR Analysis. In Nucleic Acids Isolation Methods; Bowien, B., Dürre, P., Eds. ; American Scientific Publishers: Stevenson Ranch, USA, 2003; 95-135. 6. Lee, H.; Morse, S.; Olsvik, O. Nucleic Acid Amplification Technologies: Application to Disease Diagnosis; BioTechniques Books: Boston, USA, 1997. 7. Gaur, R.K.; Krupp, G. Preparation of templates for enzymatic RNA synthesis. Methods Mol. Biol. 1997, 74, 69-78. 8. Jonson, T.; Mahlamaki, E.H.; Karhu, R.; Gorunova, L.; Johansson, B.; Hoglund, M. Characterization of genomi-cally amplified segments using PCR: Optimizing relative-PCR for reliable and simple gene expression and gene copy analyses. Genes Chromosomes Cancer 2000, 29, 192-199. 9. Ronaghi, M. Pyrosequencing for SNP genotyping. Methods Mol. Biol. 2003, 212, 189-195. 10. Buetow, K.H. ; Edmonson, M.; MacDonald, R. High-throughput development and characterization of a genome wide collection of gene-based single nucleotide polymorphism markers by chip-based matrix-assisted laser desorption/ionization time-of-flight mass spectrometry. Proc. Natl. Acad. Sci. U. S. A. 2001, 98, 581584.